There is a compliment of sorts that I’ve been given a couple time since I started my non binary transition. “You’re so brave.” While I understand the sentiment behind the expression I still keep thinking that it isn’t true. I am not being brave, I’m just trying to be me. I guess there is an inherent bravery that is required to “come out” in a society that is rather homophobic and transphobic but bravery certainly isn’t a quality that is the foundation of transition. What if I told you that I didn’t have any other option than to begin my transition and that not transitioning was slowly killing me? I have been living with depression my entire life. It is a burden that has dogged me pretty much constantly since I was a small child. A large part of my depression has been due to gender issues. Puberty was a traumatic experience that left me depressed for years. I was a suicidal teen. I was a suicidal young adult. I hated inhabiting a gendered body. I hated trying to live up to society’s gender roles. I sucked at being a girl… I was even worse at being a woman. There were years where just surviving was enough of a struggle that I was so focussed on day to day feeding myself and getting to work that my gender dysphoria took a back seat to survival. Eventually I met my spouse and life got easier but with life getting easier, I wasn’t getting happier. Again the doldrums of depression became my resting normal. Initially I wrote it down to burn out and a very challenging degree but there was more to it that I didn’t have words for. A discontent that seeped through every pore of my being. I’ve mentioned before how pregnancy and postnatal depression left me broken, isolated and invisible. At the time I thought it was a case of me struggling with the loss of my queer identity in that the world was reading me as a cishet woman everytime I was out in public, what I didn’t realise was the cis and woman parts were far greater issues than being perceived as heterosexual. Just before my kids were born I shaved my head and started presenting far more butch than I had ever done previously but it was still not enough and I was already in crisis. Through online community I found validation as a person with ambiguous gender. I found language to describe my existence. There were other people like me out in the world. That validation pulled me back from the brink of suicide in a way that no amount of therapy or psychiatric medication had ever been able to do. At the same time though, it was hard feeling like the only place I could be myself was in cyberspace with the people inside my phone. There is a weird type of dissociation that happens when your life is split in two, one place where you can explore your identity and get the personal validation that you’ve never experienced before and then the day to day world where you are still playing a character that is only a fraction of who you are. It is very easy to get lost in the fantasy of cyberspace and start living there more than in your own body. For about a year I spent more time in my cyber existence than in with my family and that half life did a massive amount of damage to all my relationships. Integrating the parts of me into one cohesive whole became necessary. Acknowledging my non binary identity in my “real” life was the only way I could continue to live. Coming out is not a singular event. I have been coming out to myself, my friends and family for the better part of two years. Going public on social media and starting a blog is only the very tip of the iceberg. After much soul searching and processing I am finally at a place where I can accept myself for who I am and pursue the things I need to be myself in all my multi gendered glory. There is no bravery in survival. It is either survive or die. I am not brave for being non binary trans. Where I will concede I have shown some bravery is in being public about my transition and adding my face and name to my story. Even then the bravery is only minimal as I have gone public with a very supportive family and community backing me up and ready to support me through any backlash. The reason I chose to be public about my non binary transition is because I had no access to information when I was dealing with being non binary in the beginning. There aren’t enough stories of mine out there for other non binary people to read. Even within the trans community, non binary people are by far in the minority. We need voices and we need representation. It is awkward putting yourself out there at a time that is, by nature, scary and intensely vulnerable but we need our stories told. So instead of calling me brave rather compliment me on my willingness to share my journey. I am here for you, I am here for non binary visibility, I am trying to survive. 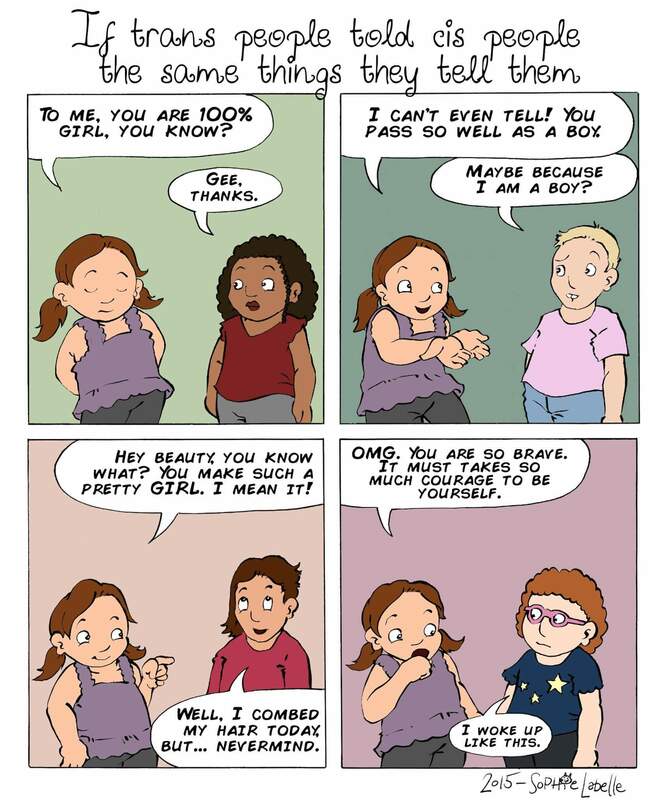 Check out Assigned Male by Sophie Labelle. I think people are startled and shook up by authenticity. The don’t see that the choice is to suppress (and get depressed) or to let it out, and go on living. I also agree that the more variety of trans voices out there, the better for everyone. For a long time I was indecisive about transition, until I realized that the choice wasn’t just between butch and trans man. Still not sure where in the middle I’m going to end up, but at least I know that I’m trans. There is so much beautiful middle ground for us to inhabit. Gender is a construct and I’m going to build a happy place for me, on my terms, that fits me… I don’t need other people to understand the shape of my gender. The choice between suicidal depression and authentic self expression is hardly a choice at all. I choose to live. Bravo, Eli. Excellent post. I too know about being more yourself in the virtual world than in the real one, but it seems that I am not brave enough to tread firmly in the real one, especially not having a backup system like yours. Thank you for adding your voice and face to the spectrum of gender colours. Oh, and the hair, of course! 😀 Take care. The support system took a long time to develop. The trans support group I went to helped a lot. I would definitely recommend trying to find a community to exist in face to face. Luckily my spouse and I have been dealing with my gender non conformity for many years. They are far more supportive now after years of talking and more than a little related crisis.